Raleigh BSA Tour de France Restoration – BSA Tour de France Restoration. BSA Tour de France Restoration. I was recently given by my neighbour this 1976 Raleigh/ BSA Tour DE France bike. It was bought in 1977 and according to the internet it was made in October, 1976. My neighbour, who died in 2017, owned it from new when he was 18 and used it every day for a few years as his main transport. When I got it was in a sorry state as you can see below. The tyres are perished and split, the chain was toast, and it was covered in crud. The frame and paint work was pitted with light rust, the wheels were very tatty so I decided early on to replace them as I believe they were not worth saving and possibly unsafe. Here’s how the bike would have looked originally from an old catalogue picture. As you can see it was quite a smart bike new and at £96.95 not that cheap in 1976, accounting for inflation that would be £774.67, as of 2018. Six weeks wages for me back then. More recently I found this scan on eBay of all places. 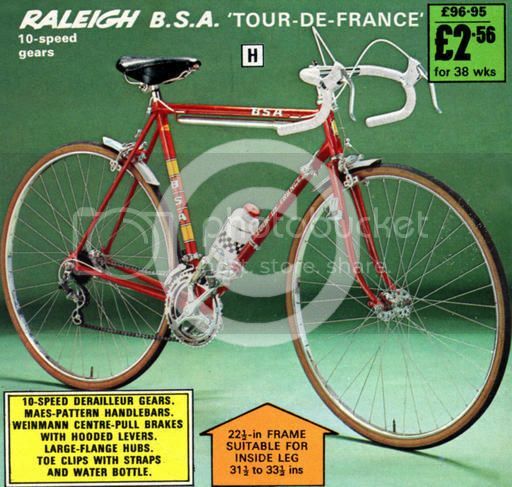 It’s from a Littlewoods catalogue from 1976, as you can see they sold a range of BSA branded Raleigh bicycles, the Tour de France ( botton right) being the top of the range. So, to get work , work stand out tools at the ready I started to take the bike apart. After an hour or so I ended up with a load of parts. All I had to do now was clean them all up. Various parts after they had been in the oxalic acid for 24 hours, still in need of a good clean. The quill stem on the bike. It is a 9/16th spanner for BB cup, but I couldn’t get it to turn. So I’ve decided to leave it , I gave it a good clean and replace the bearings with new ones in a race, which, incidentally I bought from a really old fashioned bike shop in Abingdon, cheaper than online. My first task was to clean up the bottom bracket, using the videos on YouTube I learned how to dismantle the B.B. and clean, discarding the old rusty bearings. Using the help from Forums like Cycle Chat and Facebook groups like Vintage Raleigh Bikes I gained useful information about how to take things apart. I also found out that Oxalic Acid will remove rust from chrome in an overnight soak, so I bought some on eBay to give it a go. It certainly works, but there’s still a lot of cleaning to do with wire wool, steel brushes, white spirit and WD40 and polish. Here’s some images of the cruddy parts . Raleigh branded but made in France Huret rear derailleur. Made in England pedals, missing the toe straps. A before and after of a pair of brackets. The oxalic acid removed the rust, but the still needed a good clean. These rubber hoods are going to take some cleaning. Raleigh branded Swiss made Weinmann centre pull brakes. I think it needs new bar tape and brake cables, inners and outers. The first thing to clean up was the frame, it was quite badly pitted in places and scratches from use and various attachments like the rack and bottle cage. The lock had to be cut off with bolt croppers. I removed the rack and decided not to keep it, and sold that on Facebook. the mudguards are off and waiting to be cleaned up and sold, I found someone on the CycleChat forum that had some short mudguards for sale as per the catalogue photo, which have arrived. These vintage Weinmann will polish up well and will suit the bike nicely. I cleaned the frame with a very fine wire wool from eBay, T-cut, polish, hot soapy water and my steam cleaner to get rid of the grease in the hard to get at places. It has made a massive difference, but the it still looks a bit tatty, others prefer to call it patina. Had to careful here I did not want to damage the decals anymore than they already were. Years of gunk. I cleaned out the inside of the bottom bracket with de-greaser and a steam cleaner, discarded the old loose ball bearings and bought a set of bearings in races from my local bike shop, Pedal Power in Abingdon I really good proper bike shop, run by the same family for many years. I could not remove the fixed cup on the drive side, I didn’t have the right tool, the adjustable cup on came loose easily enough. The wheels and tyres were next. The tyres were useless, worn, split and perished, well, they’re over forty years old, the wheels could have probably have been saved, but I decided to get new ones from another eBay seller Baldwins Cycles, a referral from someone on Cycle Chat and a pair of Raleigh branded gum walled tyres from another eBay seller SDJ-Sports . Old mismatched tyres, the inner tube was squeezing out of the sides on one of them. The old wheels were sold on eBay, someone saw more value in them than I did, but they did have rather nice Sturmey Archer hubs, perhaps I should have kept them…oh well, they’re gone now. Buying new ones has saved me quite a lot of work, steels wheels in the wet don’t work very well, I know this from the steel wheels on the Dawes Kingpin ( read about that here), I restored a few years back. I discovered the new rear wheel axle is wider than the old wheel, 130 mm as opposed to 120mm. I’ll have to deal with that at some point. I had quite bit of trouble removing the cotter pins on this bike, I tried various methods and the stubborn buggers would not come out. In the end I used a variation of the idea on RJ The Bike Guy’s YouTube video ( lots of great cycle related videos on his channel) and brute force! I finally got them out but not without damaging them, so new ones were bought from Pedal Power in Abingdon, they’re cheap as chips. Using Autosol Metal Polish the chain ring and crank arms cleaned up really well. I did try to remove the pressed washers off the end of the pedal so I could service them but they were not coming off without damage so I left them, they were revolving quite smoothly anyway. I doused them in a lot of 3in1 oil and they are even better and they cleaned up quite well. 3in1 oil gets a lot of bad press from cycling snobs but I likes it and have been using it on and off on bikes and other things for over 50 years. Today I tackled the Weinmann brakes, these were mucky and clogged up with years of dirt and grease, brake blocks were rock hard with age, almost fossilised! The Raleigh/Weinmann badge had come off the centre of the rear brake, I managed to save it and glue it back on. They come apart quite easily, I used a toothbrush, wire wool and white spirit. White spirit is a bit of a revelation to me, I had no idea what a good cleaning agent it was for cruddy bikes. A before and after clean up photo. I’ve bought some replacement brake blocks since the photo was taken. Next up, the front derailleur, always been a dark art for me, always had trouble with them and this one would prove to be particularly challenging. I decided to take the whole thing apart to give it a good clean, not taking into account the spring in the mech. Gah! I wish I hadn’t started it, getting apart and cleaning, polishing with white spirit and a stiff brush was easy enough but getting it back together again took me nearly three hours, having to put together some kind of Heath Robinson device to clamp the sprung part together whilst I put the nuts and bolts back in. I thought I’d lost one of the nuts from this, after spending half an hour looking for it I realised that one of them was in the wrong place on the derailleur. The spring is encased in that black grommet circled in red. Nice and clean and finally back together, still quite a bit of pitting on them though. Now on to the rear derailleur. This was not so much of a faff as I expected, after the adventure of the above, I was expecting this to be worse but it was much easier. It’s a Raleigh branded Huret made in France, probably a budget version of their main brands. Cleaned with a stiff brush, tooth brush, wire wool and white spirit, all parts put together with some Park Tools grease as are all of the moving parts that I have refurbished. All clean and shiny and running smoothly, this was a nice easy task compared to the front derailleur. Easy job next, the down tube shifters, they’re quite fiddly and rusty but they are just collection of washers and shims, as long as you remember the order they come apart you’ll be OK, They’ve have come cleaned up nicely and work well. I’ve seen on other sites other BSA road bikes of this era the down tube shifters have the French brand Huret on the band. The Brooks leather saddle was dry and brittle to touch. I smothered the saddle in Brooks Proofide and left it for a few days and then a few more times over the last couple of weeks. It’s softened up nicely. There was a bulge on the right side of the saddle nose, I experimented by putting a trigger clamp on the bulge and left it for a few days, I pleased to see that the bulge has mostly gone. The leather has buffed up really well and the finish belies it’s age. The metal work under the leather is quite tarnished and rusty in places, and difficult to get at, I cleaned it up as best I could and lubricated it. The seat clamp has cleaned up nicely with wire wool, white spirit and and stiff wire brush. As you can see the bars were in a bit of a mess. I discarded the old cables, cable covers and bar tape, bought new cables from Pedal Power in Abingdon and white cloth bar tape from Vintage Velo in West Sussex. The handlebar had some light corrosion but cleaned up very well with fine wire wool and AutoSol chrome polish, same treatment for the chrome seat post. I was lucky with that, they are notorious for getting stuck in the seat tube, it was a hell of a job getting the post out of my Dawes Kingpin. The new wheels have arrived from eBay seller Baldwins Cycles. They look good I just hope they’re in keeping with the bike. I’ve hit a problem with the new wheels, the space between the the wheel dropouts is 120mm and the hub on the wheel is 130mm. There’s some options open to me, cold set the frame/chain stays, that is spread them out using a plank and brute force or a combination of long thread and nuts and spread the frame at the drop outs. I emailed Baldwins Cycles to see if they had a suggestion to my problem, they posted me thinner locking nuts, which i put on the axle and that sorted the problem and a lot of faff. See photo below. Now I come to the bottle cage, this was a cheap chromes wire thing, that had rusted badly as had the chrome clamps. They were probably the worse condition things on the bike. I was going to to throw them away, but after a bit of research I couldn’t find a suitable replacement for the budget. I spent quite a lot of time cleaning the rust off and and rubbing them down, then using a rattle can of Halfords Chrome Paint , which I already had from another project. I gave them a good eight or nine coats and they have come up really well, so one less thing in the landfill site. Bottle Cage after oxalic acid bath before clean up. Clamps before and after clean. The end result, pretty pleased with the way they came up. I found a similar looking bottle to the one in the catalogue photo on eBay for £3.59. Time to put the bike back together at last, this filled me with trepidation, its all very well taking things apart but getting them back together again is another matter. I started with the easy stuff, refitting bottom bracket spindle and new bearing race, that was nice and straight forward, its easy with the correct tools, time, and videos on the the tube of you. The most help though came from folks on CycleChat.net and my book Zinn and The Art of Road Bike Maintenance. A great book. Next was the chain set, pedals again a straight forward task, the front derailleur was easy to set up at this stage though I wasn’t sure if it was going to work after that bloody nightmare of putting it back together after the refurbishment. The headset and front fork, fitted with new bearings and grease that went fairly straight forward except I got a bit stuck with which way the various rings and washers went, fortunately I had photos to refer to to keep me in check. Then the saddle and seat post just add some grease and in the post goes, the saddle is smartened up with many coats of proofide. Here we have the fork, headset, handlebar and bottom bracket back on the bike. The frame is as clean and tidy as I can get it with out a total respray. I think it looks pretty good. A wash, then polish with a fine wire wool and car polish T-Cut. The Park Tools cycle stand is a very good piece of kit, make the job a lot easier. The chain-set, pedals, which I did not take apart but just doused the spindle with a lot of 3-in1 oil, front and rear derailleur, cleaned up brake levers and calipers, frame mounted gear levers, second hand Weinmann short mudguards, seat post and saddle. Oh, and the lamp bracket on the fork. New wheels and tyres, I used the old inner tubes, there was nothing wrong with so ne need to throw them away. Jagwire brake cables, and gear cables, these are new from the local bike shop, and were much easier to put on that I thought, although I did have a bit of a faff threading the brake cables through the lever, the cable stop was to big for the gap. I had to fiddle about here to get the cable stop to underneath and back inside the lever housing on both levers. Got it done. Chain and bar tape to go. Complete now with Velox Tressostar bar tape, chain, bottle cage with bottle and new Raleigh vintage style steel pump. I had a bit of a challenge fitting the chain through the rear derailleur, I couldn’t quite get my head round which way it was suppose to go, then I realised that the wire spring was fitted incorrectly, once I sorted that out everything else went into place. Took it out for a test ride, and is smooth and like a new bike, the gears needed a bit of a tweak, but other than it it rode very well. A reminder of what it looked like new. Folks may (or may not) be interested in how much I spent on this. From the Bay of E.
I sold the Pletscher rack, Mudguards and the wheels for £35.00. Total Outlay = £131.58. Don’t tell the missus. Value for money? I had a great time and learned a lot. I really enjoyed the project. Another update, I took the bike out for another test ride today, a 20 mile run out to town, the head tube locking nut came off and struggled to get back on, further investigation revealed that I had too many new ball bearings in the crown race so the head set was not sitting properly. All sorted now though and my ride home was much better than the ride out. I have to thank Richard at Oxford Bike Works for getting me out of trouble today. Here is another article about a refurbished Tour de France. Brooks Challenge Tool Bag and a Ride. Since I’ve had this bike I’ve been looking for a Brooks Challenge tool bag that would match the Brooks saddle, I didn’t want a new one, they’re very expensive, so a bade my time and one eventually came up on eBay, on a B.I.N or best offer, the offer was accepted and it arrived a few days later. Not quite the right shade of brown but I can live with, and it looks like its from the correct period. I took the bike for a short utility ride today, just 8.8 miles to the shops and back, it rides very well, but I’m still getting used to the down tube shifters and I might have to take the rear wheel off and replace a nut for a smaller one, A job I’m putting off because it looks like it might be a faff. what this space. New Brooks Challenge Tool bag on Saddle. I recently came across this scan of another catalogue page from a mail order book for a later version of the BSA Tour de France. The catalogue is probably a later version of the one posted above by about two years. The specification of the bike has changed quite a bit, the colour is now blue with yellow bar tape. The brake levers have the addiction of ‘dual levers’ otherwise known as suicide levers, presumably because they weren’t very effective braking, ( it’s telling that you don’t see them anymore on modern bikes) . There’s also evidence of cost saving, because the excellent Brooks leather saddle on the earlier bikes have been replaced by a ‘lightweight sports saddle’. Also it looks like the chain set and cranks have been changed to lighter alloy cotter-less kit. A large rear reflector had been added to the bike, probably because of new road safety legislation at the time. Above: A scan of the catalogue page probably circa 1978. The price of the bike has increased by £3.00 to £99.95. My research indicates that these BSA bikes were only sold through these large mail order books around about this time, I haven’t found any evidence that this range of bicycles were for sale in retail shops. 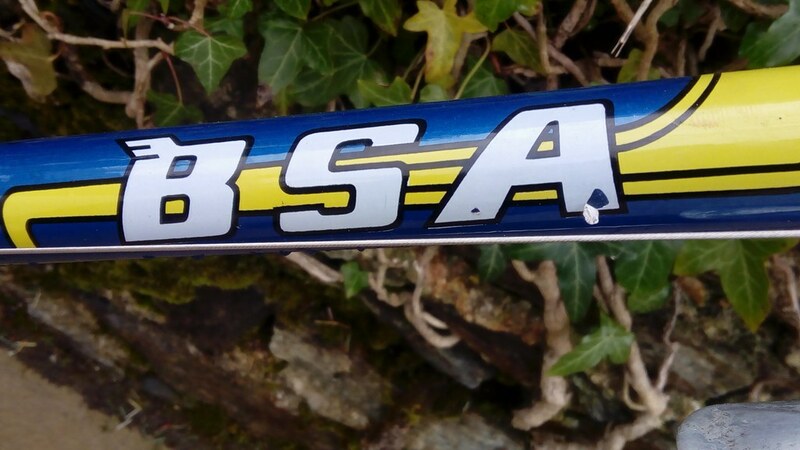 Above: A photo of a later blue BSA Tour de France currently for sale on eBay, (February 2019) that looks original including the Raleigh tyres. Above: The dual levers, the stem has been updated too. Above: Close-up of the chain set and pedal from another eBay bike. Above: The ‘Sports Saddle’ , not in my opinion as classy as the leather Brooks saddle, but this one has managed to stay in good condition for a forty year old seat. BSA “Tour De France” c.1976 – Battered, bruised and… burnt? Another blog about a BSA Tour de France, a later model. Part two of the BSA tour of Britain. This has been a bit of an exercise in ‘period’ upgrading, without unnecessarily over-capitalising the bike. The way I mostly save on expenses is to do all the work myself, to avoid labour costs. Not only that, but it’s more satisfying, especially when building up your own wheels. Apart from consumables – chains, cables, tyres, bar tape, bearings, brake pads – I also try and use as many recycled components as I reasonably can. The new bottom bracket cartridge turns in easily on the re-tapped threads, but it tightens up well. A Genetic brand 110.5 mm axle was about right for chain line. An interesting blog about a BSA Tour of Britain that looks like the same specification as the Tour de Fance. The BSA team had won the Tour of Britain in 1952, and to commemorate this, the “Tour of Britain” model was released. It wasn’t a high-end bike even then, but it seems at least the main tubes were Reynolds 531 and it had reasonable BSA and GB components and a Brooks saddle. Raleigh took over BSA in 1957 as the ‘golden age of bicycles’ was drawing to a close. Fast forward to 1978, and this model has become a pretty basic heavy steel ‘sports bike’ . heavy metal ? – strewth ! British Heart Foundation London to Brighton bike ride. I’m sure I mentioned this in an earlier post, but I’m told by the wife of the original owner of this BSA Tour de France, that about 15 years ago he rode this bike on the famous British Heart Foundation London to Brighton bike ride, a mass bicycle event with several thousand cyclists set off from Clapham Common, London on Sunday 16th June, and finish on Brighton Beach the same afternoon, following a beautiful route through the Surrey and Sussex countryside to raise money and awareness for sufferers of heart diseases. Well I thought it would be a good idea to round off this project with completing the same event on the same bike, so watch this space more details to follow. You can read about the BHF here.